“I shall argue that a predominant quality to be expected in a successful gene is ruthless selfishness” (Dawkins, 1976). 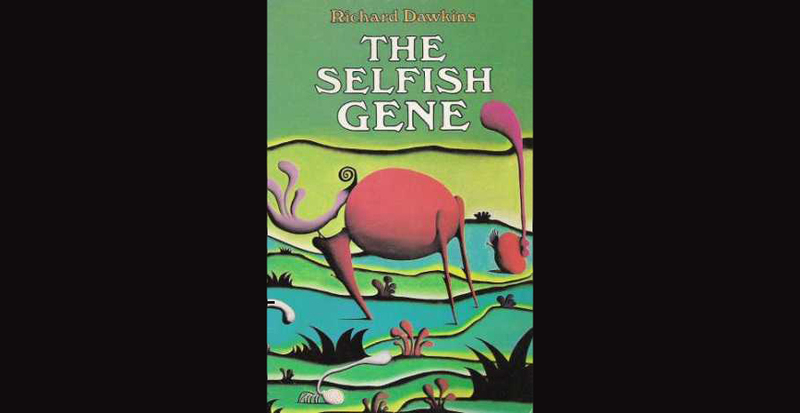 So wrote the evolutionary biologist, Richard Dawkins, in Chapter One of his famous book, The Selfish Gene. In a time when Darwin’s Natural Selection was still envisioned at the level of behavior and gross phenotype, Dawkins turned the world on its head by proposing that Natural Selection occurred only at the level of the gene. And not the genome as a whole, but individual genes. Nowadays, with research into epigenetics, most molecular biologists acknowledge that Dawkin’s simplified theory is not entirely true and that inheritance and therefore selection can occur at levels above the genome. Nevertheless, the book prompted a paradigm shift in the way both scientists and laypeople think about evolutionary genetics. I must admit an embarrassing truth that, despite my own studies of genomics and genetics, I have only just picked up this book and started to read. Mind you, I had the best of intentions and have owned it for several years. But until yesterday, I hadn’t turned a page of it. The slow reader that I am, I made it through Chapter One before I was hit with a nap attack (no comment on Dawkin’s writing which is excellent; I’m just a poor reader). The first chapter is now filled with numerous underlines and comments and all the morsels sucked dry, as it were. In my snail-like progression through the book thus far, I’ve been struck by the thought that, though Dawkin’s may well be right on some level, I find the metaphor of selfishness unappealing and leaning towards falsity. Were I to make a similar metaphor, I would neither call genes selfish nor altruistic, neither sacrificing another’s well-being for their own nor vice versa. Instead, I would call them necessarily symbiotic, exhibiting a beneficial dependency upon one another. Those genes which are less symbiotic and apt to go “rogue” are less conserved across species and therefore less evolutionarily successful. Dawkins saw (and maybe still sees, I don’t know his current thinking on the matter) genes as inter-competitive. But I believe this is too much of an anthropomorphism. I instead see genes as a vast network of nodes, interconnected, interdependent, with an entire cell or organism being affected by a single gene’s propensity to mutate, bifurcate, or even disappear. The level of conservation of individual genes is good indication of their relative interconnectedness. For instance, those genes which are constitutively active throughout all cells of an organism at all times can be considered “foundational” to this large network of gene nodes. These are termed, “housekeeping genes”. They are also the most highly conserved of genes, showing extensive DNA and amino acid sequence conservations and are shared by the greatest range of creatures, from unicellular to multicellular organisms. You can imagine that because these genes are so vital, a great many cellular functions would cease to work should they be knocked down. This process quickly weeds out those cells which do have mutated forms of these genes, keeping their conservation tightly controlled. An image created by using String 9.05. 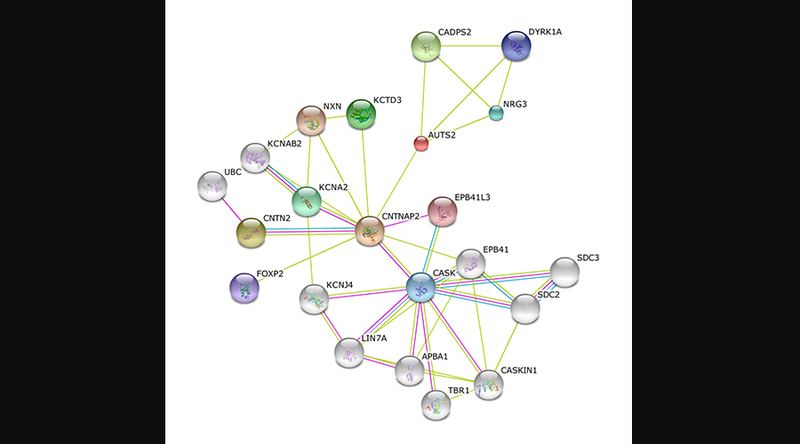 It’s a network centered around the two autism-related gene nodes, CNTNAP2 and AUTS2. Tissue-specific genes, on the other hand, are less foundational, oftentimes less detrimental should a disruptive mutation arise, and show comparatively poorer sequence conservation. This is of course part of their own unique evolution in that their relative instability has led to the development of novel functions in different tissues, and so as I’ve argued elsewhere this propensity for mutation has been selected for even though it plays a dangerous game of see-saw. These examples illustrate something fundamental: namely, that the level of sequence conservation is a measurement of self-preservation for a given gene, because the more a gene mutates, the greater it risks loss of function. Therefore, those genes which win the game of Natural Selection by Dawkin’s measuring stick are those which are conserved most across the largest number of species, and these are the ones which make themselves indispensable and upon which the greatest number of cellular processes depend. This argues neither for selfishness nor for altruism, but symbiosis. It indicates that the relationship between genes is one of the most important factors in self-preservation. The greater the interrelationship, the greater the conservation.